There's a wise old tale that states you should never kill a ladybug because they'll bring you good luck, but if you've ever come across an Asian lady beetle, you know they can be the bane of your existence. Although Asian lady beetles look just like ladybugs, several characteristics will make you not want these pesky bugs hibernating in your house throughout the winter. They may be a huge pest, but there are ways to get rid of Asian beetles in the house. Adult Asian lady beetles are known to be oval-shaped and measure to be about a quarter inch long. You can find these beetles in a variety of colors, such as tan, orange and red, and they have many black spots on the wing covers. Although the black spots are a common indicator of these beetles, some have limited spots or none at all. You can tell the difference between male and female beetles because male beetles have few to no spots and females are generally multi-spotted. If you look closely, some beetles have small, dark M- or W-shaped markings on the whitish area behind their head. Asian lady beetles lay eggs that are yellow, oval and in clusters. These clusters can be found on the underside of leaves with larvae that are orange or black. In the native Asian lands, you can see the beetles living in trees, mainly cohabitating in forests or orchards. In Japan, you can find them in soybean fields. In the United States, though, you can find the beetles living in ornamental and agricultural crops, such as roses, corn, soybeans, alfalfa and tobacco. Where are Asian Lady Beetles From? Asian lady beetles, also known as Harmonia axyridis (Pallas) were first reported in the early 1900s. Asian beetles are native to Asia, hence their name, and can be found in China, Russia, Korea and Japan. Asian lady beetles are known to dwell in trees and fields and they prey on aphids (a minute bug that feeds by sucking sap from plants and causes massive damage to crops) and scale insects. From the 1960s to 1990s, the U.S. Department of Agriculture used Asian lady beetles to control damaging crop pests. Large amounts of these beetles were released in Georgia, South Carolina, Louisiana, Mississippi, California, Washington, Pennsylvania, Connecticut and Maryland to control the damage to crops, especially to pecan and apple trees. Ladybugs and Asian lady beetles may look the same, but they act very differently from one another. Ladybugs are highly beneficial, harmless insects that don't bite, and they don't congregate in large numbers. When it gets cold, ladybugs will seek shelter outdoors, not indoors. These two bugs look similar to one another, but Asian lady beetles are a bit larger than ladybugs. Ladybugs are also bright red with black spots. Asian Lady beetles emit a foul-smelling, yellow liquid from their leg joints when they feel threatened. If Asian lady beetles have found a place in your home, it's difficult to get them out. Although there are several ways to get rid of them, even if they're inside your house, the easiest way is by using a vacuum cleaner. The beetles like to congregate in large numbers throughout the late fall and disperse over winter. They'll cluster on the sides of homes or buildings and will find their way in through small cracks, crevices, natural breaks in window panes, door jams or through the foundations of houses and buildings. They like to find places to spend the winter and will hibernate until the first warm days of late winter/early spring. Asian lady beetles are attracted to lighter colored houses and buildings. The reason they stay away from darker homes or buildings is that they prefer places that are illuminated by the sun. This is why you'll mostly find them congregating on the south or southwest side of a structure. The key to getting rid of Asian lady beetles is prevention through the use of spraying. Using a fast-acting synthetic spray should prevent Asian lady beetles from forming clusters or entering your home in the fall. You should spray the south and southwest exposure of your house or building in the fall and spring because once the beetles have found a place in your home, it's difficult to get them out. If you don't want to use a synthetic spray to prevent Asian lady beetles from infesting your house or building, there are natural steps you can take. Since the beetles will come to your house throughout fall, closer to winter, you need to make sure that you winterize your home. Make sure that all of your doors and windows are sealed, caulk your windows and replace weather stripping so that it's not easy for the beetles to come into your house. You also need to act fast when you see the first sign of these bugs. Asian lady beetles can multiply pretty quickly because they're good at communicating and attract one another with their scents. It's pretty easy to get rid of Asian lady beetles by upping your gardening game since they eat aphids. If you want to deter them from entering your home, start a garden and it will attract them to that area. If you want to keep them completely away from your home, plant mums. Lady beetles hate mums, and they're actually a key ingredient in flea powder. All you have to do is plant mums near windows and other areas around your house or building. Planting mums on the south facing wall will surely deter them. 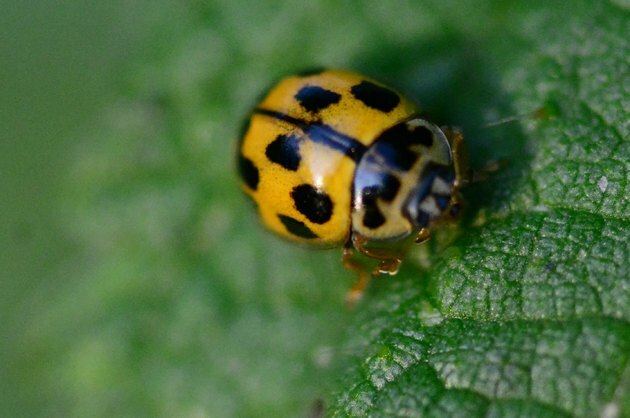 There are a couple of natural ingredients you can use to deter Asian lady beetles. You can use Diatomaceous Earth powder by spreading it around the base of your house or building. Asian lady beetles also don't like citrus or citronella scents. You can make a citrus spray by using wild orange essential oil. Dilute the oil in water, then spray this solution in the areas where the beetles are. Asian lady beetles also hate bay leaves and cloves. You can place small bags of cloves or bay leaves in areas that are heavily infested. Unlike regular ladybugs, orange ladybugs can be super aggressive and bite, so you have to be careful around them. Ladybugs prefer not to bite humans, but they do have sharp mouths. More often than not, though, they'll release a foul odor to ward off prey instead of resorting to biting. Ladybugs aren't poisonous or dangerous, can't transmit parasites or diseases and if they do bite you, it will only cause a raised red bump. Although they do have sharp mouths, they rarely break through the skin when they do bite.